Lan Pham, daughter of Tan and Levy Mai Pham of Abbeville, is the Spring 2009 Outstanding Graduate for the University of Louisiana at Lafayette. She was named the Outstanding Graduate in the Ray P. Authement College of Sciences. Selected by the Alumni Association Awards Committee, the award is based on leadership, scholarship and service. Eight finalists are nominated by the deans of their respective colleges. Spring 2009 Outstanding Graduates are: Caroline Randall, Arts; Katherine Dallas, Business Administration; Lauren Jankower, Education; Amy Henschke, Engineering; Elise Peltier, General Studies; Megan Broussard, Liberal Arts; Renee Judice, Nursing; and Lan Pham, Sciences. Pham is a biology major with a 4.0 GPA who has been on the Dean’s List every semester. She is a member of the Alpha Lambda Delta Honor Society. Pham holds the State of Louisiana Robert C. Byrd Honors Scholarship, the Dr. Bernard and Marie Lahasky Scholarship, the UL Lafayette Centennial Scholarship, the UL Lafayette Valedictorian Scholarship, the UL Lafayette Literary Rally Scholarship, the UL Lafayette SGA International Friendship Non-Endowed Scholarship, the TOPS Performance Scholarship, the Lafayette Medical Scholarship among several others. She is the recipient of the Air Force Science Award, the U.S. Marine Corps Scholastic Excellence Award, the Louisiana Regents Scholar Certificate of Recognition, the Oran Perry Burke Memorial Honors Program Award and the National Science Foundation Undergraduate Grant Award. She contributed to a published article in the Journal of Comparative Physiology. 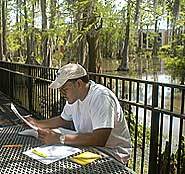 In addition, Pham received the UL Lafayette Honors Program Molett Best Essay Award and the UL Lafayette Pre-Professional Society Award of Merit among many others. Pham is the co-coordinator of Cajun Camp, a free fun day for individuals with physical or mental disabilities. She’s been actively involved in the planning of Cajun Camp since its inception. She’s been in charge of publicizing the camp, scheduling bands, registering participants and seeking sponors. She also volunteered at Abbeville General Hospital where she assisted nurses in labor and delivery and fed newborns after delivery. She’s volunteered with the Acadian Society for Autistic Citizens, the Down Syndrome Association of Acadiana, the American Heart Association, St. Joseph’s Diner and Journey Hospice. Following graduation, Pham will attend the Southern College of Optometry in Memphis, where she will pursue a Doctor of Optometry Degree. She has been awarded a Southern College Optometry Dean’s Endowed Scholarship. She is one of only 12 students to receive such an award out of 600 applications.